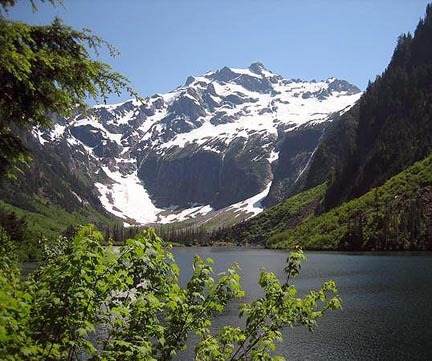 Goat Lake, Lewis County, Washington, from Washington Trails Association, http://www.wta.org. As our class begins the journey into the world of sustainability, we started the course by reading a couple of broad articles looking at sustainability in the big picture. After discussing the articles in class, we have started to gain a better grasp on how large the concept of sustainability actually is. Defining the word sustainability is something that is always changing and nearly impossible to fit into one sentence. One of the definitions we found that seemed to cover the majority of sustainability can be found on The New Palgrave Dictionary of Economics Online (see “Sustainability“). One of the primary issues concerning sustainability is due to the tragedy of commons. In terms of sustainability, the tragedy of commons is referring to humans’ dependence to resources and their inability to break away from them, or spend them more modestly. Eventually, these non-renewable resources will be exhausted, thus creating the tragedy of commons. These resources include, but are not limited to, forests, water, air, energy sources, and even land space. These resources will be abused because no one will accept responsibility. Therefore, a focused approach to sustainability is important. 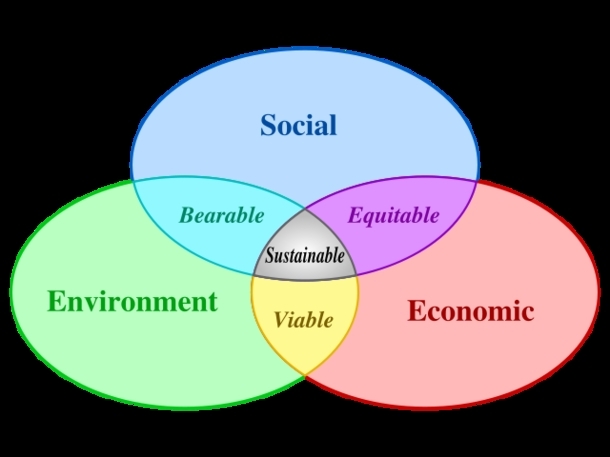 Three pillars of sustainability Venn diagram. Sustainability is comprised of three primary aspects of life: social, environmental and economic. These individual parts make up the ‘Pillars of Sustainability’. To quote Tri Robinson of Huffington Post, “If any of the three pillars of sustainability collapse, so goes the civilization they support.” The three pillars are intertwined so that action within one impacts action within the others. This creates need for action that is positive in all three areas, or the least negative in each area. Sustainability in it of itself is a lofty goal. The idea of being completely sustainable is something that is increasingly becoming not a dream but a necessity. However, to accomplish this necessity it has become obvious that a framework for acceptable trade-offs be developed to protect all interests as humanity strives towards sustainability. The danger is accepting solutions that solve a large problem while creating smaller ones. Robert Gibson tackles this problem head on by creating a framework of rules for accessing potential trade-offs. His framework contains such categories as Maximum gains, Burden of argument on trade-off proponent, Avoidance of significant adverse affects, Protection of the future, Explicit justification, and Open process. While this goes a long way into helping to ensure no significant compromises are made while seeking to attain sustainability, ambiguity is an unavoidable danger. Gibson gives the following hypothetical scenario. “Should decision-makers accept major damage to the interest of tribal people displaced by a new dam, if that dam promises more material security for larger numbers of poor farmers downstream” (Gibson, 175)? It quickly becomes obvious that a framework is not only important but absolutely necessary. Tri Robinson. “Three Pillars of Sustainability and the Fall of a Nation.” Huffington Post, May 7, 2009.